Stinking Goosefoot is so called because of its obnoxious stench of rotting fish. Despite this and its unprepossesing appearance, it is the subject of protection in Britain under the Wildlife and Countryside Act because it is now extremely rare and still declining in numbers. The plant is a member of the family Chenopodiaceae, which also contains other similarly unattractive annual plants. Stinking Goosefoot can still be found on the cliffs around Poole Harbour as well as near The Fleet in Dorset. 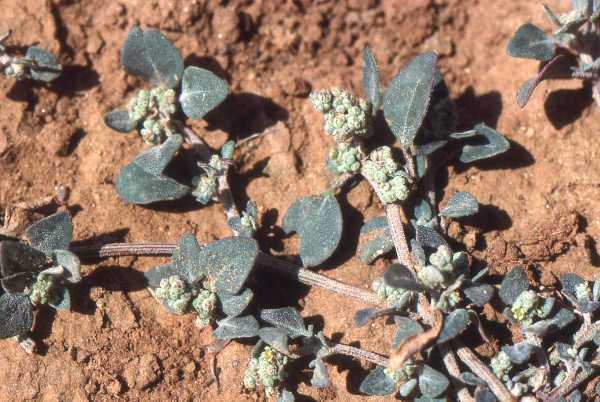 This plant has an overall greyish and rather mealy appearance. Its flowers are borne on almost leafless spikes and appear in July and August.